The IFOR Secretariat joins FOR Peace Presence and IFOR members around the world in expressing alarm and concern regarding assissination attempt on members of the Peace Community of San José de Apartado, including German Graciano, Legal Representative. "Schools are hot beds of unrest and violence and this is observed as the overflow of the social and political currents generally. With the influence of media and usage of mobile apps students are being increasingly swayed to resort to display of intolerance and often violently. Often what is seen as assertion of rights by one section is equally an assault of the rights of another section. Dialogue is being substituted with hate filled rhetoric." "There are provisions of the law which deal with abuse of all kinds and laws which are enacted to protect the child. An effort was made to encourage teachers to use the laws and also to "conscientise" students about what was acceptable and unacceptable. All problems and solutions must face the test of justce and fairplay." The sessions were elicitive and interactive. On October 26th 2017, eleven LGBTIQ Faith Leaders came before the world at United Nations Headquarters in New York City to tell their stories. They came together under the auspice of the Ethics of Reciprocity project and with great courage poured their hearts and souls on that international stage. Long before that, however, they came to know each other as members of the same family. It is with great sadness and disbelief that we, members of the Ethics of Reciprocity family, mourn the passing of one of our own. On December 11th, 2017, Abubakar Sadiq Yussif passed away. 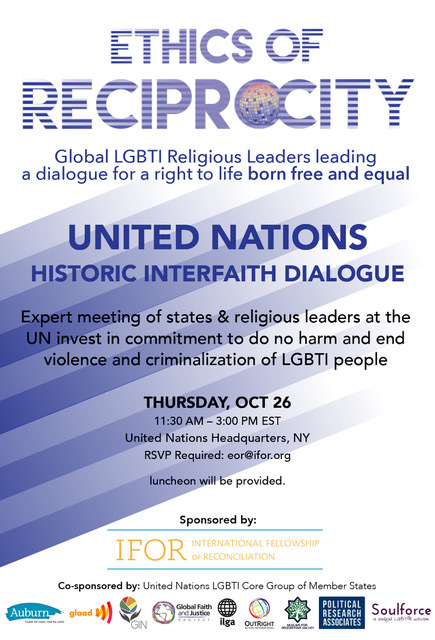 On Thursday, Oct 26 from 11:30am – 3:00pm, IFOR is hosting an unprecedented gathering of conservative & progressive religious leaders, diplomats and human rights experts in a project called the Ethics of Reciprocity (EOR). IFOR has a long history of engagement at the intersection of gender and peace building and has a long history of advocacy against violence and discrimination on the basis of gender. With millions of people around the world suffering increasing amounts of violence and discrimination on the basis of sexual orientation and gender identity, IFOR is proud to host this important conversation. 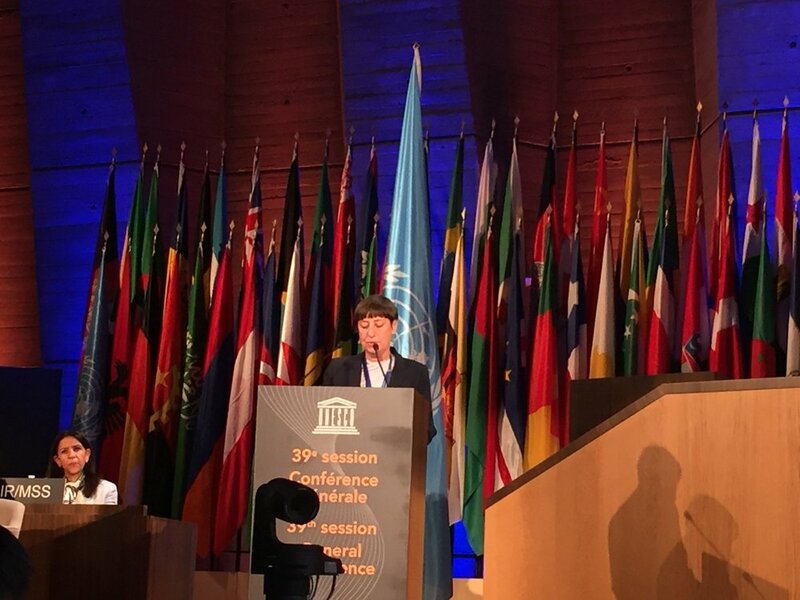 EOR was envisioned by IFOR's representative to the United Nations Dr. Patricia Ackerman. IFOR's Branch in Madagascar, Fikambanana Entanin’ny Fampihavanana eto MADAGASIKARA (FIEFA) celebrated its 25th anniversary recently. The anniversary was held in the village of St. François of Antananarivo. The association chose as it's theme "La force ne vaut pas la vertu" or "force is not worth the cost of virtue." The anniversary was an opportunity for members of FIEFA to consider the moral importance of the movement's values and to renew the commitment to promote active nonviolence and peace. Fellowship of Reconciliation Peace Presence (FORPP) is a non-governmental organization dedicated to providing safety, political visibility and solidarity to communities and individuals at risk in Colombia who are working to promote human rights, peace and justice. In addition to providing ongoing physical accompaniment to our partners, we also provide political accompaniment through meetings with Colombian civil and military officials as well as embassies, UN and other international officials. We provide visibility for these struggles through delegations, speaking tours, publications and an online presence, building bridges between communities in the global North and South on issues important to both. FORPP is supported by several branches of IFOR and is an active part of the IFOR community. For more information or if you are interested in becoming an international accompanier, click here. Help Stop the eviction of Bedouin tribes in Israel! IFOR Members in Israel are fighting the forced displacement of Bedouin Communities in the Negev. They are asking for support by calling on people of conscience around the world to sign a letter to Israel's Prime Minister. Please click here to sign the petition. IFOR members write: "In 1949, Israel evicted the Bedouin tribe Abu Al Qi'an from its lands in Wadi Zabbālih in the northern Negev. In 1956, the Israeli government settled the tribe in Umm Al Hiran and Atir in the north‐east region of the Negev. However, the government never granted these localities official recognition. Now, more than sixty years later, the government of Israel has ruled to evict its Bedouin citizens from Umm Al Hiran and settle Jewish citizens there instead, in a new Jewish town be called "Hiran." Please sign the petition, addressed to Israel's Prime Minister Binyamin Netanyahu, calling upon him to prevent this outrage of evicting Bedouin citizens in order to settle Jewish citizens in their place."